For any other use, see Amalgam. Dental amalgams were first documented in a Tang Dynasty medical text written by Su Gong (苏恭) in 659, and appeared in Germany in 1528. In the 1800s, amalgam became the dental restorative material of choice due to its low cost, ease of application, strength, and durability. There are, according to Geir Bjørklund, indications that dental amalgam was used in the first part of the Tang Dynasty in China (AD 618–907), and in Germany by Strockerus in about 1528. Evidence of a dental amalgam first appears in the Tang Dynasty medical text Xinxiu bencao《新修本草》 written by Su Gong (苏恭) in 659, manufactured from tin and silver. Historical records hint that the use of amalgams may date to even earlier in the Tang Dynasty. It was during the Ming Dynasty that the composition of an early dental amalgam was first published, and a text written by Liu Wentai in 1505 states that it consists of "100 shares of mercury, 45 shares of silver and 900 shares of tin." Ever since its introduction in the Western world in the 1830s, amalgam has been the subject of recurrent controversies because of its mercury content. Early amalgam was made by mixing mercury with the filings of silver coins. In 1833 Englishmen, Edward Crawcour and his nephew Moses Crawcour (incorrectly referred to as "the Crawcour brothers"), brought amalgam to the United States, and in 1844 it was reported that fifty percent of all dental restorations placed in upstate New York consisted of amalgam. However, at that point the use of dental amalgam was declared to be malpractice, and the American Society of Dental Surgeons (ASDS), the only US dental association at the time, forced all of its members to sign a pledge to abstain from using the mercury fillings. This was the beginning of what is known as the first dental amalgam war. The dispute ended in 1856 with the disbanding of the old association. The American Dental Association (ADA) was founded in its place in 1859, which has since then strongly defended dental amalgam from allegations of being too risky from the health standpoint. Amalgam has been used for many years for restorations, commonly known as fillings. Prior to 1900 many compositions were tried but few were successful when placed in the oral environment. Around 1900, small amounts of copper and occasionally zinc were added. Zinc acts as a scavenger because it prevents oxidation of the other metals in the alloy during the manufacturing process. Zinc accomplishes this by combining readily with oxygen to form zinc oxide. Amalgam restorations made from this balanced formula were reasonably successful and its longevity increased. However, one disadvantage that remained was fracture at the tooth-amalgam interface commonly called marginal fracture. Sn8Hg (γ2 phase) was considered to be responsible for this problem. This phase has been shown to be the weakest phase in the set amalgam and is subject to corrosion, particularly at the tooth-amalgam interface. In 1962 a new amalgam alloy, called Dispersalloy, was introduced with the addition of a spherical silver-copper eutectic particle to the traditional lathe-cut Ag3Sn particle in a ratio of 1:2. The mixture of these two types of particles is known as admix alloy. The benefits of this alloy was to strengthen the set amalgam and reduce the γ2 phase (Sn8Hg). The increased copper in the silver-copper eutectic reacted preferentially with tin so that Sn8Hg could not form. Early results from the clinical use of this new amalgam showed an improvement in marginal integrity. About 10 years later, another alloy, called Tytin, was introduced by adding significant amount of Cu3Sn together with Ag3Sn, in the form of a unicompositional spherical particle to eliminate the γ2 phase. Both of these relatively new alloys raised the copper content from 5%, present in the older balanced composition alloy, to about 13% for the newer alloys. 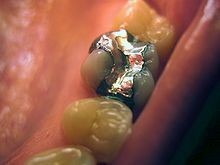 Dental amalgam is produced by mixing liquid mercury with an alloy made of silver, tin, and copper solid particles. Small quantities of zinc, mercury and other metals may be present in some alloys. This combination of solid particles is known as amalgam alloy. The composition of the alloy particles are controlled by the ISO Standard (ISO 1559) for dental amalgam alloy in order to control properties of set amalgam such as corrosion and setting expansion. It is important to differentiate between dental amalgam and the amalgam alloy that is commercially produced and marketed as small filings, spheroid particles, or a combination of these, suitable for mixing with liquid mercury to produce the dental amalgam. Amalgam is used most commonly for direct, permanent, posterior restorations and for large foundation restorations, or cores, which are precursors to placing crowns. The reaction between mercury and alloy when mixed together is termed an amalgamation reaction. It will result in the formation of a silver-grey workable mass which can be condensed into cavities. After condensing, the dental amalgam is carved to generate the required anatomical features and then hardens with time. In the pre-1986, the standard composition of alloy is referred to as conventional amalgam alloy. More recently (post-1986), there have been a change in the compositional standard of the alloy due to better understanding of structure-property relationships for the materials. Conventional amalgam alloy commonly consists of silver (~65% ), tin (~29%), copper (~8%) and other trace metals; current amalgam alloy consists of silver (40%), tin (32%), copper (30%) and other metals. To fabricate an amalgam filling, the dentist uses a mixing device to blend roughly equal parts (by mass) of shavings of a silver-base alloy with mercury until the shavings are thoroughly wetted. The silver alloy is typically 40–70% Ag, 25-29% Sn, 2–40% Cu and 0–2% Zn (when the alloy is formulated. Zn is a scavenger and is mostly consumed during melting and lost as oxide). The dentist packs the plastic mass, before it sets, into the cavity. The amalgam expands ≈0.1% over 6–8 hours on setting. The final structure is a metal matrix composite, where γ1, η and γ2 phases, are a matrix for unreacted original alloy, minus the fast-reacting β-phase and excess Sn. Amalgam is a mixture of two or more metals (alloy) with mercury which has been purified first by distillation to remove impurities. Currently, major components of the alloy are silver, tin, and copper. The composition of the alloy powder is controlled by ISO standard for dental amalgam alloy (ISO 1559) to control the properties of amalgam. Creep or plastic deformation happens when subjected to intra-oral stresses such as chewing or grinding. Creep causes the amalgam to flow and protrudes from the margin of the cavity forming unsupported edges. ‘Ditch’ is formed around the margins of the amalgam restoration and make it prone to fracture. The γ2 phase of amalgam is primarily responsible for high values of creep. Corrosion occurs when an electrolytic cells of anode and cathode set up in the presence of electrolytes. The multiphase structure of dental amalgam can contribute as an anode or cathode with saliva as electrolytes. Corrosion may significantly affect the structure and mechanical properties of set dental amalgam. In conventional amalgam, γ2 phase is the most reactive and readily forms an anode. It will break down releasing corrosion products and mercury. Some of the mercury will combine rapidly with unreacted alloy and some will be ingested. The chances of ditching are further increased. Copper-enriched amalgams contain little or no γ2 phase. The copper–tin phase, which replaces γ2 in these materials, is still the most corrosion-prone phase in the amalgam. The corrosion however is still much lower than conventional amalgam. In spite of that, it is thought that corrosion actually offers a clinical advantage. The corrosion products will gather at the tooth-amalgam interface and fill the microgap (marginal gap) which helps to decrease microleakage. Even so, there are no reports of increased marginal leakage for the copper-enriched amalgams indicating that sufficient quantities of corrosion product are produced to seal the margins. Microleakage is the leakage of minute amounts of fluids, debris, and microorganisms through the microscopic space between a dental restoration and the adjacent surface of the cavity preparation. Microleakage can risk recurrent caries. An amalgam restoration develops its strength slowly and may take up to 24 hours or longer to reach a reasonably high value. At the time when the patient is dismissed from the surgery, typically some 15–20 minutes after placing the filling, the amalgam is relatively weak. Therefore, dentists need to instruct patients not to apply undue stress to their freshly placed amalgam fillings. In addition, amalgam restorations are brittle and susceptible to corrosion. The alloys are broadly classified as low-copper (5% or less copper) and high-copper alloys (13% to 30% copper). The solid particles of the alloy are either spherical or irregularly shaped microspheres of various sizes or a combination of the two. The low-copper alloys have either irregular or spherical particles. High-copper alloys contain either spherical particles of the same composition (unicompositional) or a mixture of irregular and spherical particles of different or the same composition (admixed). The properties of set amalgam depends upon the alloy composition—particle size, shape and distribution—and heat treatment control the characteristic properties of the amalgam. Here, the alloy particles contain both Ag3Sn(γ) and Cu3Sn(ε), similar to the low-copper lathe-cut alloys, but with much greater amount of the Cu3Sn(ε) phase. These alloys are usually spherical. When liquid mercury is mixed with these alloys, it diffuses into the surface of these particles forming Ag2Hg3 as well as Cu6Sn5. The difference in eta prime phase of admixed alloy and unicomposition alloy is that in unicomposition alloy, Cu6Sn5 crystals are much larger and rod-shaped than those in admixed alloy. Copper added in unicomposition causes removal of gamma2 phase. Amalgam is tolerant to a wide range of clinical placement conditions and moderately tolerant to the presence of moisture during placement. In contrast, the techniques for composite resin placement are more sensitive to many factors. Mercury has properties of a bacteriostatic agent whereas certain methacrylate polymers (for example TEGMA, triethylene glycol methacrylate) composing the matrix of resin composites "encourages the growth of microorganisms". In the Casa Pia study in Portugal (1986–1989), 1,748 posterior restorations were placed and 177 (10.1%) of them failed during the course of the study. Recurrent marginal decay was the main reason for failure in both amalgam and composite restorations, accounting for 66% (32/48) and 88% (113/129), respectively. Polymerization shrinkage, the shrinkage that occurs during the composite curing process, has been implicated as the primary reason for postoperative marginal leakage. However, there is low-quality evidence to suggest that resin composites lead to higher failure rates and risk of secondary caries than amalgam restorations. Several reviews have been made by using database in the Cochrane Library where randomized controlled trials of few studies comparing dental resin composite with dental amalgams in permanent posterior teeth were compared. This review supports the fact that amalgam restorations are particularly useful and successful in parts of the world where amalgam is still the material of choice to restore posterior teeth with proximal caries. Though, there is insufficient evidence to support or refute any adverse effects amalgam may have on patients, new research is unlikely to change opinion on its safety and due to the decision for a global phase-down of amalgam (Minamata Convention on Mercury) general opinion on its safety is unlikely to change. These are some of the reasons why amalgam has remained a superior restorative material over resin-base composites. The New England Children's Amalgam Trial (NECAT), a randomized controlled trial, yielded results "consistent with previous reports suggesting that the longevity of amalgam is higher than that of resin-based compomer in primary teeth and composites in permanent teeth. Compomers were seven times as likely to require replacement and composites were seven times as likely to require repair. There are circumstances in which composite serves better than amalgam. For example, when a more conservative preparation would be beneficial, composite is the recommended restorative material. These situations would include small occlusal restorations, in which amalgam would require the removal of more sound tooth structure, as well as in "enamel sites beyond the height of contour". For cosmetic purposes, composite is preferred when a restoration is required on an immediately visible portion of a tooth. Dental amalgam does not by itself bond to tooth structure. This was recognized as a shortcoming by early practitioners such as Baldwin. He recommended that the prepared cavity be coated with zinc phosphate cement just prior to filling with amalgam, in order to improve the seal and retention. The practice did not become universally accepted and eventually fell into disuse. Until the 1980s, most amalgam restorations placed worldwide were done without adhesives, although in the 1970s a polycarboxylate-based adhesive liner was formulated specifically for this purpose  In the mid-1980s the first reports of the use of resins to bond amalgam to etched tooth structure, much like is done for composite resins, appeared in the literature. Since then, a number of papers have been published on laboratory as well as clinical studies of the technique. For large cavity restorations, features such as pins, slots, holes and grooves can be used for the retention of large amalgam restorations, but they do not reinforce the amalgam or increase its strength. There is no current scientific evidence to justify the extra cost and effort associated with the use of adhesively bonded amalgam restorations in comparison with nonbonded amalgam restorations. In view of the lack of evidence on the additional benefit of adhesively bonding amalgam compared with nonbonded amalgam, it is important that clinicians are mindful of the additional costs that may be incurred. The placement of amalgam restorations can potentially cause sensitivity post-operatively. According to R. Weiner, a protective layer or liner should be placed prior to the placement of amalgam to act as a buffer, helping to reduce sensitivity to the tooth. There are different liners that can be used in dental practices today, many of which contain zinc. Examples of lining materials include zinc oxide eugenol, zinc phosphate, glass ionomer cement, zinc poly-carboxylate and resin. A varnish can be applied to the cavity wall to provide a good marginal seal. The varnish should be insoluble in water and is usually composed of a resin in a volatile solvent. When applied to the cavity, the solvent evaporates, leaving the resin behind to seal the dentinal tubules. The amalgam can then be packed into the cavity. Concerns have been raised about the potential for mercury poisoning with dental amalgam when used in a dental filling. Major health and professional organizations regard amalgam as safe but questions have been raised and acute but rare allergic reactions have been reported. Critics argue that it has toxic effects that make it unsafe, both for the patient and perhaps even more so for the dental professional manipulating it during a restoration. A study by the Life Sciences Research Office found that studies on mercury vapor and dental amalgam "provided insufficient information to enable definitive conclusions." They identified several "research gaps", including: "well-controlled studies using standardized measures that evaluate whether low level [mercury vapor exposures] produce neurotoxic and/or neuropsychological effect", studies on "co-exposure to HgO and methylmercury", studies on "in utero exposure to HgO", "occupational studies on [pregnant workers] with well-defined HgO exposure", studies on the absorption of Hg2+ by the "human neonatal gut from breast milk", studies on "whether dental professionals have increased incidences of kidney disease, emotional instability, erethrism, pulmonary dysfunction, or other characteristics of occupational HgO exposure", studies on whether there exist "potential gender differences" or "genetic basis for sensitivity to mercury exposure." The removal of amalgam fillings is not recommended for reasons other than a true hypersensitivity to mercury. Mercury levels in blood and urine have been shown to rise for a short period of time following the removal of amalgam restorations and no studies have demonstrated any health gain from restoration removal. Removal involves exposure to mercury vapor released during the removal process. Amalgams also contribute to mercury toxicity in the environment. With regards to amalgam placement and removal in pregnancy, research has not shown any adverse effects for the mother or fetus. However, research is inadequate to determine the chance of harm occurring and therefore placement and removal should be avoided during pregnancy if possible. In response to The Minamata Convention on Mercury, the European Commission has confirmed its position that individual nations should work to gradually scale down the use of dental amalgam. Dental amalgam is thought to be relatively safe to be used as a restorative material as it is used in low doses. Amalgam vapour can be released through chewing but this is minimal. However, there is an increased release of mercury following the exposure of electromagnetic fields generated by MRI machines. Some patients may develop allergic reactions to it. Resin composite, glass ionomer cements and ceramic or gold inlays can be used as alternatives to amalgam. In the United States, dental offices have typically disposed of amalgam waste down the drain. The wastewater is sent to the local sewage treatment plant, which is not designed to treat or recycle mercury or other heavy metals. The mercury contaminates the sludge processed at the treatment plant, and thereby can spread the mercury in surrounding communities, if the sludge is land-applied for disposal. Dental amalgam is the largest source of mercury received by U.S. treatment plants. The U.S. Environmental Protection Agency (EPA) promulgated an effluent guidelines regulation in 2017 which prohibits most dental practices from disposing dental amalgam waste down the drain. Most dental offices in the U.S. are required to use an amalgam separator in their drain system. The separator captures the waste material, which is then recycled. The European Commission has issued a Waste Directive that classifies amalgam waste as a hazardous waste. The waste should be separated from other waste by fitting amalgam separators in all dental practices. Mercury can cross the placenta leading to stillbirths and birth defects. A combination of mercury and non-ionizing radiation has been suggested as a factor in the recent increase in reported autism spectrum disorders. It has been reported that there is a positive correlation between the maternal and cord blood mercury levels. Although there is no evidence linking amalgam use and pregnancy damage, it is advisable to delay or avoid dealing with amalgam fillings in pregnant patients. The dental operating team should deal with amalgam with proper use of personal protective equipment to protect themselves. ^ "About Dental Amalgam Fillings". U.S. Food and Drug Administration. U.S. Food and Drug Administration. Retrieved 2 October 2015. ^ Ferracane, Jack L. (2001). Materials in Dentistry: Principles and Applications - Jack L. Ferracane - Google Boeken. ISBN 9780781727334. Retrieved 19 September 2012. ^ Ferracane, Jack L. (2001). Materials in Dentistry: Principles and Applications. Lippincott Williams & Wilkins. p. 3. ISBN 978-0-7817-2733-4. ^ a b c Bjørklund, G (1989). "The history of dental amalgam (in Norwegian)". Tidsskr Nor Laegeforen. 109 (34–36): 3582–3585. PMID 2694433. ^ a b c d Czarnetzki, A.; Ehrhardt S. (1990). "Re-dating the Chinese amalgam-filling of teeth in Europe". International Journal of Anthropology. 5 (4): 325–332. ^ Bharti R, Wadhwani KK, Tikku AP, Chandra A (2010). "Dental amalgam: An update". J Conserv Dent. 13 (4): 204–208. doi:10.4103/0972-0707.73380. PMC 3010024. PMID 21217947. ^ Westcott, A. (1844). "Report to the Onondonga Medical Society on metal paste (amalgam)". American Journal of Dental Science IV. 1st Ser: 175–201. ^ American Society of Dental Surgeons. (1845). American Journal of Dental Science. Harvard University. p. 170. ^ Molin, C (February 1992). "Amalgam—fact and fiction". Scandinavian Journal of Dental Research. 100 (1): 66–73. doi:10.1111/j.1600-0722.1992.tb01811.x. PMID 1557606. ^ a b c d e f g h i j k l m n o p q r s t u v w x y z aa ab ac ad McCabe, J.F. ; Walls, A.W.G. (2008). Applied Dental Materials. Blackwell Publishing Ltd.
^ a b c d e f g h i j k l m n o p q r s t u v w x y z aa ab ac ad Sakaguchi, R.L. ; Powers, J.M. Craig's Restorative Dental Materials. Mosby. ^ a b Bonsor, S., Pearson, G., & Dawson Books. (2013). A clinical guide to applied dental materials. Amsterdam : London :: Churchill Livingstone. ^ Mitchell RJ, Okabe T (1996). "Setting reactions in dental amalgam. Part 1. Phases and microstructures between one hour and one week". Crit Rev Oral Biol Med. 7 (1): 12–22. doi:10.1177/10454411960070010101. PMID 8727104. ^ Mitchell RJ, Okabe T (1996). "Setting reactions in dental amalgam. Part 2. The kinetics of amalgamation". Crit Rev Oral Biol Med. 7 (1): 23–25. doi:10.1177/10454411960070010201. PMID 8727105. ^ a b c Beech, D. R. (1 September 1982). "High copper alloys for dental amalgam". International Dental Journal. 32 (3): 240–251. ISSN 0020-6539. PMID 6958652. ^ Corrosion of dental amalgam and its component phases. Guthrow CE, Johnson LB, Lawless KR J Dent Res. 1967 Nov-Dec; 46(6):1372-81. ^ a b c d Soncini JA, Maserejian NN, Trachtenberg F, Tavares M, Hayes C (2007). "The longevity of amalgam versus compomer/composite restorations in posterior primary and permanent teeth: findings From the New England Children's Amalgam Trial". J Am Dent Assoc. 138 (6): 763–772. doi:10.14219/jada.archive.2007.0264. PMID 17545265. ^ Christensen, GJ (2005). "Longevity of posterior tooth dental restorations". J Am Dent Assoc. 136 (3): 201–203. PMID 15782524. ^ Bohaty BS, Ye Q, Misra A, Sene F, Spencer P (2013). "Posterior composite restoration update: focus on factors influencing form and function". Clin Cosmet Investig Dent. 5: 33–42. doi:10.2147/CCIDE.S42044. PMC 3666491. PMID 23750102. ^ Bernardo, M; Martin, MD; Lerouz, BG (2007). "Survival and reasons for failure of amalgam versus resin-based composites posterior restorations placed in a randomized clinical trial". The Journal of the American Dental Association. 138 (6): 775–783. doi:10.14219/jada.archive.2007.0265. hdl:10451/34312. PMID 17545266. ^ Burgess, JO; Walker, R; Davidson, JM (2002). "Posterior resin-based composite: review of the literature". Journal of Pediatric Dentistry. 24 (5): 465–479. ^ Estefan, D.; Agosta, C. (2003). "Eliminating microleakage from the composite resin system". General Dentistry. 51 (6): 506–509. ^ Forss, H; Widstrom, E (2003). "The post-amalgam era: a selection of materials and their longevity in the primary and young permanent dentition. Others express concern regarding the Children's Amalgam Trial's elevated serum and urine mercury content in the children with the amalgams". International Journal of Paediatric Dentistry. 13 (3): 158–164. doi:10.1046/j.1365-263x.2003.00453.x. ^ Qvist, V; Thylstrup, A (1986). "Restorative treatment patterns and longevity of amalgam restorations in Denmark". Acta Odontologica Scandinavica. 44 (6): 343–349. doi:10.3109/00016358609094344. ^ Fuks, AB (2002). "The use of amalgam in pediatric patients". Journal of Pediatric Dentistry. 24 (5): 448–455. ^ Newman, SM (1991). "Amalgam alternatives: what can compete?". The Journal of the American Dental Association. 122 (8): 67–71. doi:10.14219/jada.archive.1991.0246. ^ Baldwin, H (1897). "Cement and amalgam fillings". Br J Dent Sci. XL (699): 193–234. ^ Zardiackas, L D; Stoner, G E; Smith, F K (1976). "Dental amalgam stabilization by selective interfacial amalgamation". Biota Med Dev Art Org. 4 (2): 193–203. doi:10.3109/10731197609118650. ^ Varga, J; Matsumura, H; Masuhara, E (1986). "Bonding of amalgam filling to tooth cavity with adhesive resin". Dent Mater J. 5 (2): 158–164. doi:10.4012/dmj.5.158. ^ Shimizu, A; Ui, T; Kawakami, M (1986). "Bond strength between amalgam and tooth hard tissues with application of fluoride, glass ionomer cement and adhesive resin cement in various combinations". Dent Mater J. 5 (2): 225–232. doi:10.4012/dmj.5.225. ^ Shimizu, A; Ui, T; Kawakami, M (1987). "Microleakage of amalgam restorations with adhesive resin cement lining, glass ionomer cement base and fluoride treatment". Dent Mater J. 6: 64–69. ^ Shimizu, A; Ui, T; Kawakami, M; Tsuchitani, Y (1987). "Adhesive amalgam restoration with resin cement lining: Basic technique and three clinical cases". Jpn J Conserv Dent. 30: 68–75. ^ Staninec, M; Holt, M (1988). "Bonding of amalgam to tooth structure: Tensile adhesion and microleakage tests". J Prosthet Dent. 59 (4): 397–402. doi:10.1016/0022-3913(88)90030-3. PMID 3283322. ^ Agnihotry, Anirudha; Fedorowicz, Zbys; Nasser, Mona (2016). "Adhesively or non-adhesively bonded amalgam restorations for dental caries | Cochrane". Cochrane Database of Systematic Reviews. 3: CD007517. doi:10.1002/14651858.CD007517.pub3. PMID 26954446. ^ Murad M. No available evidence to assess the effectiveness of bonded amalgams. Evid Based Dent. 2009;10(4):106. doi: 10.1038/sj.ebd.6400682. ^ Weiner, R. (2011). "Liners and bases in general dentistry". Australian Dental Journal. 56: 11–22. doi:10.1111/j.1834-7819.2010.01292.x. PMID 21564112. ^ Chandrasekhar, V (2 March 2018). "Post cementation sensitivity evaluation of glass Ionomer, zinc phosphate and resin-modified glass Ionomer luting cements under class II inlays: An in vivo comparative study". Journal of Conservative Dentistry. 13 (1): 23–27. doi:10.4103/0972-0707.62638. PMC 2883803. PMID 20582215. ^ McCabe, Walls, John F. , Angus W.G. (2008). Applied Dental Materials. Blackwell Publishing Ltd.
^ a b "About Dental Amalgam Fillings". Food and Drug Administration. Retrieved 19 April 2015. ^ "Final opinion on dental amalgam". European Commission. 2 June 2015. Retrieved 17 January 2016. ^ "Dental Amalgam: What Others Say". American Dental Association. May 2015. Retrieved 17 January 2016. ^ Rathore, Monika; Singh, Archana; Pant, Vandana A. (1 January 2012). "The Dental Amalgam Toxicity Fear: A Myth or Actuality". Toxicology International. 19 (2): 81–88. doi:10.4103/0971-6580.97191. ISSN 0971-6580. PMC 3388771. PMID 22778502. ^ Kal, B. Ilhan; Evcin, O.; Dundar, N.; Tezel, H.; Unal, I.; Kal, B. Ilhan; Evcin, O.; Dundar, N.; Tezel, H. (22 November 2008). "An unusual case of immediate hypersensitivity reaction associated with an amalgam restoration, An l case of immediate hypersensitivity reaction associated with an amalgam restoration". British Dental Journal, British Dental Journal. 205, 205 (10): 547–550. doi:10.1038/sj.bdj.2008.981. ISSN 0007-0610. PMID 19023309. ^ Mutter, J; Naumann, J; Walach, H; Daschner, F (2005). "Amalgam: Eine Risikobewertung unter Berücksichtigung der neuen Literatur bis 2005" [Amalgam risk assessment with coverage of references up to 2005]. Gesundheitswesen (Bundesverband der Arzte des Offentlichen Gesundheitsdienstes (Germany)) (in German). 67 (3): 204–16. doi:10.1055/s-2005-857962. PMID 15789284. ^ a b "Review and Analysis of the Literature on the Health Effects of Dental Amalgams" (PDF). Life Sciences Research Office. Retrieved 29 July 2009. ^ a b "British Dental Association" (PDF). www.bda.org. March 2008. Retrieved 27 January 2016. ^ "Mercury in Health Care" (PDF). World Health Organization. 2005. ^ "British Dental Association" (PDF). www.bda.org. March 2008. Retrieved 27 January 2016. ^ "Use of dental amalgam in the UK : what do I need to know?". British Dental Association. 24 February 2016. ^ a b Mortazavi, Ghazal; Mortazavi, S.M.J. (1 December 2015). "Increased mercury release from dental amalgam restorations after exposure to electromagnetic fields as a potential hazard for hypersensitive people and pregnant women". Reviews on Environmental Health. 30 (4): 287–92. doi:10.1515/reveh-2015-0017. ISSN 2191-0308. PMID 26544100. ^ a b "Dental Effluent Guidelines". Washington, D.C.: U.S. Environmental Protection Agency (EPA). 7 July 2017. ^ "Dental Amalgam; Fact file" (PDF). British Dental Association. February 2008. ^ "Waste Framework Directive". Environment. European Commission. 6 September 2016. ^ Mortazavi, Gh. ; Haghani, M.; Rastegarian, N.; Zarei, S.; Mortazavi, S.M.J. (1 March 2016). "Increased Release of Mercury from Dental Amalgam Fillings due to Maternal Exposure to Electromagnetic Fields as a Possible Mechanism for the High Rates of Autism in the Offspring: Introducing a Hypothesis". Journal of Biomedical Physics & Engineering. 6 (1): 41–46. ISSN 2251-7200. PMC 4795328. PMID 27026954. ^ Ngim, Chunhan; Ngim, Allister Daquan (1 December 2013). "Health and safety in the dental clinic – Hygiene regulations for use of elemental mercury in the protection of rights, safety and well-being of the patients, workers and the environment". Singapore Dental Journal. 34 (1): 19–24. doi:10.1016/j.sdj.2013.11.004. PMID 24360262. Wikimedia Commons has media related to Amalgam fillings.